Mercedes confirmed in March 2015 that it was readying a new mid-size pick-up - its first double-cab to disrupt the predominantly American and Japanese truck scene. 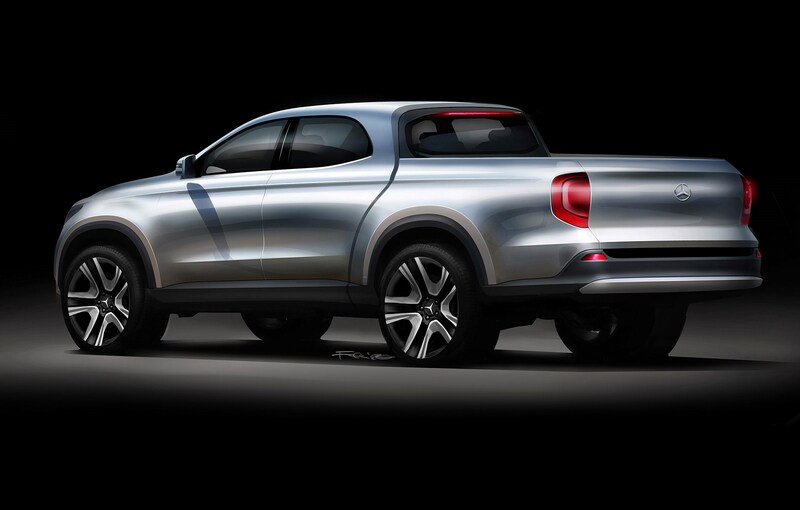 We’ve interviewed the chief of Daimler’s commercial vehicle division and produced exclusive renderings to show how the Merc pick-up will look. Read on for our scoop dossier on what is rumoured to be badged the GLT. Which certainly sounds better than the implausibly codenamed Project Andrew, Daimler’s in-house name for its pick-up project. Why is Mercedes doing a pick-up? Expansion is the catchword of M-B’s future product strategy - and that applies to vans and trucks as much as cars, according to the manager in charge, former AMG chief Volker Mornhinweg who’s working on the three-pointed star’s trucklet. How big is the worldwide market for pick-ups? The take rate for mid-size trucks is around 2.3 million units per annum, according to Daimler. The long-time leader of the pack is Toyota which sells around 700,000 of its Hilux/Tacoma twins. Next in line are Nissan, Isuzu, Ford and GMC. The VW Amarok has managed to secure a modest 3% stake of the action since launch in 2010. At this point, Mercedes will not yet talk numbers, but even optimists are struggling to forecast more than five figures in the short term. Although the Sprinter is produced in five different plants spread around the globe (and sold in 130 territories), the existing industrial footprint will not easily manufacture the pick-up due in late 2018 or early 2019, sources say. Instead, Mercedes is tipped to enter a cooperation with Nissan, which recently introduced the new D40-generation Navara built in Thailand and Mexico. The Germans are said to be particularly interested in the factory in Aguascalientes which operates under the NAFTA umbrella. Daimler is already collaborating with Renault-Nissan globally, don’t forget. The Smart Fortwo/Forfour and Infiniti Q30 are all joint ventures - and it sounds like the Mercedes GLT could be next. The common denominator of this still tentative joint venture is a modular components set consisting of ladder frame, axles and body structure. Exterior, interior and engines would be brand-specific. Four- and six-cylinder engines are earmarked for the GLT, in petrol and diesel flavours. According to a person familiar with the business case, prices are going to start around $30,000 (£21,000) in the cheapest markets. As an alternative to the standard live rear axle, buyers may specify an independent suspension as well as 4Matic AWD. Those who don’t feel like operating a six-speed manual transmission are encouraged to opt for the seven-speed automatic. The only area where you do not have a choice is bodystyle - of which there is only one, namely a four-door twin-cab, depicted in our renderings by Designwerk (first and second image in the gallery). Special features include an electric rear window in lieu of a sunroof, three different cabin style and equipment levels, a classy instrument panel inspired by GLE and GLC, a tall and wide dual cab and a tailgate which can be locked at a 90deg or 180deg angle. Just about the only detail of the modern Mercedes pick-up which reminds us of its much more basic ancestors is the traditional lever-operated handbrake. Tell us what you think of the Mercedes GLT in the comments below.